On February 12th 2016, we were in Leicester to do two shows for the Dave’s Leicester Comedy Festival. It was the second time we had been invited. The last time was for the Trial of King Richard III when we were to try the whole City and discover whether it was a deserving place to bury the bones of the King found in a car park. This time, it was Dave Bartram of Showaddywaddy who was in the dock. The Leicester Mercury wrote an article about the show. You, the judge: Is Dave Bartram guilty of crimes against music? A 63-year-old man is due to appear in Leicester this week charged with a string of offences which date back more than 40 years. He’s not up in court, though, but at Peter Pizzeria, writes Peter Warzynski. The accused is Dave Bartram, formerly of retro rockers Showaddywaddy, who’s on trial for crimes against music. He will appear before comedians – as well as a jury – and vehemently defend himself against his own back catalogue. And, he says, he’s not sorry for any of them. The charges will be revealed on the day, but I can take a punt at what they might include. Caught somewhere between a pack of fluorescent marker pens and a Teddy Boy street gang, their unique image made them instantly recognisable, even if you don’t know the faces. I ask one of the show’s performers, Thom Tuck, whether he intends to make Dave answer for all 1970s pop rock fashion in general, which the ‘Wad no doubt had a hand in popularising. “Wow,” he says. “The whole glam rock thing would be too much. As a bit of added interest, there’s also some audience participation during the mock trial – a chance to see your loved ones hauled up in front of the judge, says Thom. It’s a format they’ve used before. Has anyone ever misunderstood the idea and tried to report a real crime? Being the good sport he is, Leicester-born Dave has agreed to discuss the impending date with destiny beforehand. “I have to say I’m a little sceptical in the run-up to the trial,” he says. “But I’ll be approaching the event with a clear conscience, determined to stand my ground against whatever aspersions may be cast, resolved to come out on top and ensure justice is done. 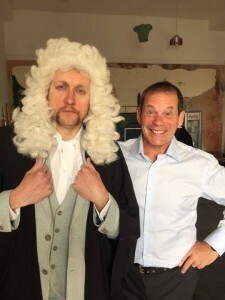 Doing the prosecuting, judging and other official comedy legally bits are Judge Howard Read (CBBC’s Little Howard); clerk, although I think they’re called legal advisers now, Thom Tuck (CBBC Horrible Histories) and guest lawyer Paul Foxcroft (Monkey Toast). Also in the mix, QCing for the night, is Deborah Frances-White. In the past, the court has put numerous celebs and famous faces on trial – including, last year, the much-maligned Richard III – who, let’s face it, probably wasn’t as misunderstood as people say. I don’t think anyone is suggesting for one minute that Dave’s crimes are on a par with the former hunchbacked monarch – although he did once, rather unforgivingly, put the bomp, in the “bomp, bomp, bomp”. But he’ll be on the stand all the same mitigating, pleading and praying for his only means of an acquittal, a legal loophole. “I have to admit to being flattered at being asked to follow in the footsteps of our great King Richard III,” says Dave. “As far as I’m aware, I don’t appear to have any skeletons lurking in my closet, particularly those of young princes. Anyway, if Dave is protesting his innocence I’m curious to know who he thinks should be up there in his place. “As regards musical criminals whose misdeeds may be seen as worse than my own, there are literally thousands, ranging from The Bay City Rollers, David Cassidy, through to a whole host of below-average performers spanning the decades. With that in mind, although it’s probably too late, I suggest to Thom freeing the glam rocker and instead establishing a Nuremburg-esque trial for reality and talent show contestants – with the same sentencing powers as the post-war proceedings of 1946. “That would be great,” he laughs. “But think of the time and the cost. Giving Dave one last desperate chance at mitigation, I ask him to explain his case. You can see a video of Dave Bartram on Trial here. Blue Monday… PREVIOUS POST | NEXT POST NEWS, NEWS, NEWS….. SO MUCH NEWS…..